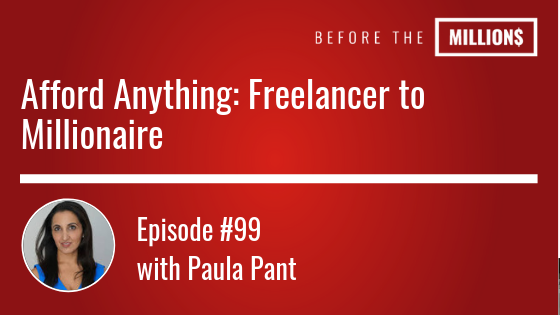 Today’s guest, Paula Pant, a freelance writer (but actually much more) started out making $21,000 a year in 2005. With a knack for saving and a frugal lifestyle (even sometimes sharing a 3 bedroom apt with 5 roommates), she was able to save a whole years worth of money to travel the world and backpack in Europe with a cost of living less than 1k per month. When she returned back to her dreaded job, she realized that things could never be the same after such an amazing experience. Paula went from freelance writing as a hobby in 2006 to a full time writer in 2010, writing for some really big outlets. 18 months later Paula had a 6 figure income and said good riddance to her JOB (Just Over Broke). One of the biggest value-bombs dropped on the episode was a moment we were discussing the sacrifice to save, simple but profound – it boils down to how bad you want it. “The more roommates you have, the cheaper rent gets”. Paula practice this until her rent was just $200, at which point she could save heavily. Today Paula is a millionaire in every sense of the word. As a thriving real estate investor and writer she gives us a ton of advice to pursue an afford anything life. Life-Hack: Run Your Own Business!